He’s only 19 years of age but already Aaron McGrath has chalked up an enviable list of credits: Redfern Now, The Code, Glitch, My Place, The Gods of Wheat Street and The Doctor Blake Mysteries. Now he’s about to add yet another ABC series, Ready For This. McGrath is playing 16 year old Levi Mackay, the budding AFL player who moves into the hostel Arcadia House with other young teens, to study sport at a specialist high school. But Drama for McGrath very nearly didn’t happen when he dropped the subject in high school. “My first TV gig was My Place. A friend told me to audition, but I had already dropped Drama. So I thought ‘What the hell!’ I gave it my best shot and then it just went from there, and I got an agent,” he says. In Ready for This, the six teenagers are far from home, but must forge a path whilst dealing with city pressures and growing up. The series has a strong Indigenous cast which for Redfern-raised McGrath is close to home. Levi deals with a reunion with his father as well as a tenuous romance with Zoe (Madeleine Madden). “The biggest similarity with me is that he’s a ‘mummy’s boy.’ He’s a friendly boy and passionate about AFL, but I grew up playing NRL,” he says. McGrath was one of several actors who contributed to the show’s early development with writer Liz Doran. “Some of the cast members had a meeting with Liz, about two years ago and brainstormed the idea,” he recalls. “We came in to talk about things with her. But despite his list of growing credits, McGrath has so far has avoided the trappings of fame, but remains reluctant to watch himself perform on screen. “I don’t really like watching myself, but I’ll follow it a bit. Maybe the first 2 or 3 episodes,” he admits. Ready For This is the work of Blackfella Films (Redfern Now, First Contact) and Werner Productions (Dance Academy). 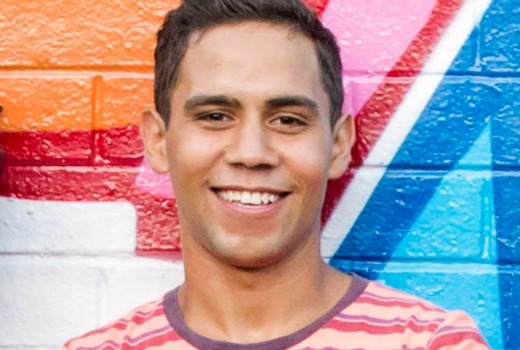 The young cast also includes Liam Talt, Majeda Beatty, Leonie Whyman and Christian Byers with Christine Anu and Lasarus Ratuere as Arcadia House adults looking after the young mob. McGrath’s love interest in Madeleine Madden was also his love interest in The Code and Redfern Now. Woeking together made playing love scenes easier, despite facing a forbidden Romeo & Juliet-style romance. “Our families don’t want us to be together but our love is too strong!” he says. For now he is content with continuing local productions, but is keeping his options open for further down the track. Not bad for one who gave up Drama classes in high school. Ready For This premieres 6:20pm Monday on ABC. Good on Aaron McGarth on a long list of successful credits to his name at only 19! Thanks for sharing David. Nice to leRn about other things he’s done that I have missed.